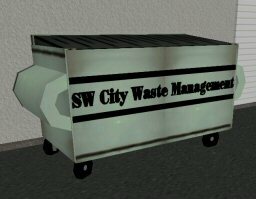 These are the standard SW City Waste Management dumpsters, perfect for any back alley. Comes in 2 versions. The normal version is fully detailed, with wheels and an interactive lid. The lite version has less details, using about 40% less cell space. Place the base object where you want the back center of the dumpster to be. Front sign tends to get sunken into the wall sometimes, fix if needed.